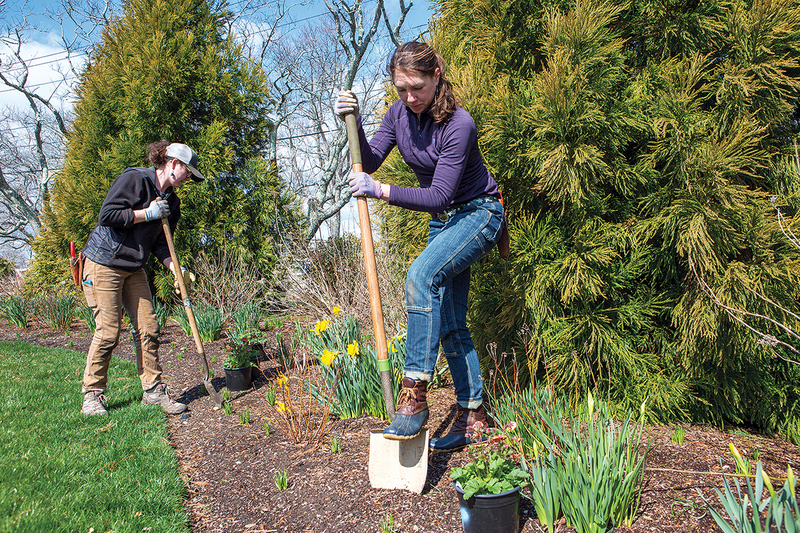 When offered a spot in the Rhode Island Nursery and Landscape Association’s apprenticeship program, Suzannah MacDonald was so excited she blurted out “yes, done” before her boss could finish her sentence. The 31-year-old fine gardener at Wild & Scenic Inc. said she “felt lucky” to be asked and considered it a vote of confidence. While she had some experience as a farmhand, the University of Rhode Island graduate faced a “learning curve” due to a lack of technical training for many of the tasks she took on in 2016 at Wild & Scenic, a coastal-preservation landscape company in South Kingstown. While she admitted she “takes newbies all the time,” for every 10 new hires she makes, two “work out” due to a combined lack of training and passion. “This is manual labor,” she said, and employees with similar “interest” and “drive” to MacDonald are hard to find. 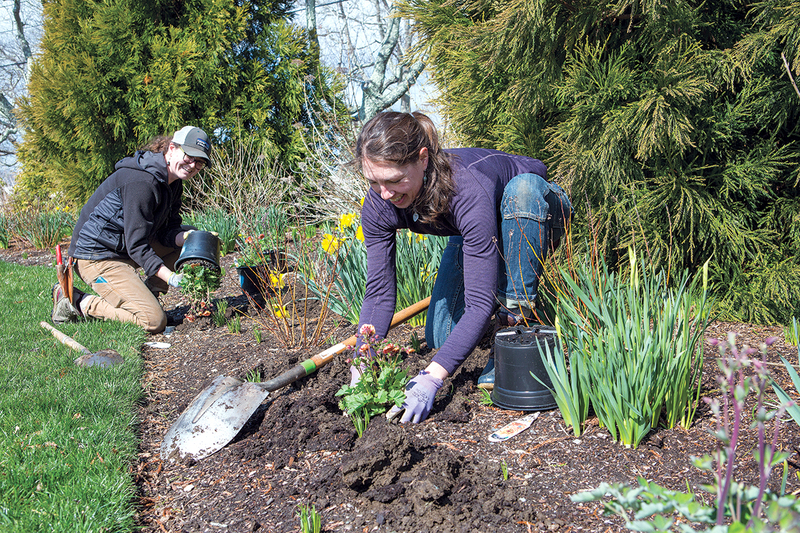 It’s a common problem in the local green-collar sector – which a 2015 URI-RINLA economic-impact study said encompasses agriculture, agricultural support, cemeteries, golf, landscaping contractors and services, and landscape-related suppliers. Demand for services has been growing but businesses say they sometimes struggle to meet it due to limited skilled labor. With the help of $171,000 in Real Jobs Rhode Island grants, research began in summer 2017 for a RINLA-led, state-registered apprenticeship program – what would become the nation’s first multiemployer apprenticeship program for the green-collar industry, according to the State Apprenticeship Council, a piece of the R.I. Department of Labor and Training that comprises local business leaders who advise the state on workforce and apprenticeship initiatives. While supporters are hopeful, the program is off to a slow start. Much of what was taught during a preliminary three-week program in February will be repeated this spring, but RINLA has yet to implement meetings specifically focused on apprenticeship programming. And most businesses that were struggling in early spring to make up for lost time during unusually cold and wet weather can’t afford to lose multiple staffers to a training program. “This industry is completely driven by the weather, and you have to be flexible,” said Gallagher. In fact, the elongated winter – which brought the coldest start to April in 11 years, according to the National Weather Service – pushed her start date back 20 days to March 29 compared with last year. 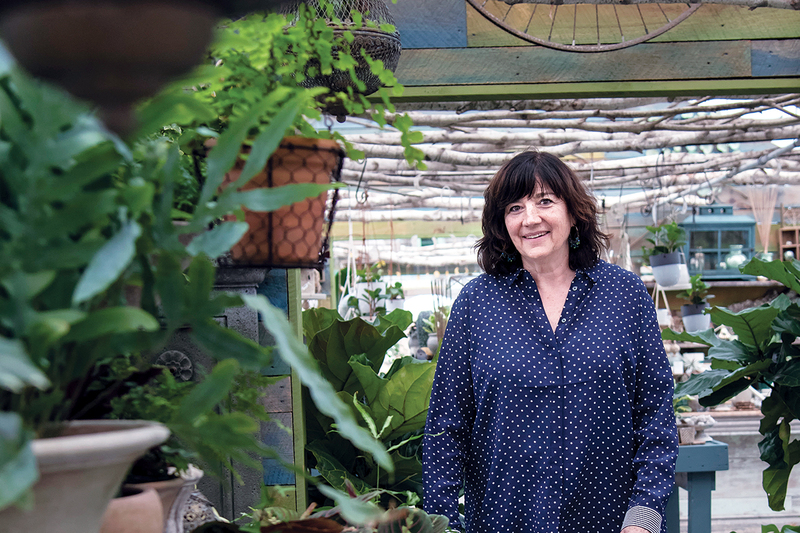 As of late April, nothing was growing and nurseries had little inventory, but Gallagher said two weeks of good weather could have her operating at peak speed. But investing in employee training, including the apprentice program, is the best chance businesses such as Matthews’ have to cut down on winter layoffs. The need for more employee training in the local industry is immediate, says RINLA Executive Director Shannon Brawley of the apprenticeship program, which formally launched April 1. “The No. 1 challenge” to operating in the state’s green-collar sector is identifying a future workforce, promoting the diversity of the industry and establishing a pipeline to high school-aged workers, she said. In designing the apprenticeship program, small- and medium-employer member companies were targeted, said Brawley, because they would be best able to “help in defining what the industry needs” in terms of training infrastructure. RINLA, in partnership with Apprenticeship Rhode Island – an arm of the U.S. Department of Labor that helps develop apprenticeship programs – applied for the multi-employer apprenticeship program with the DLT in late February. The State Apprenticeship Council recommended approval, which was granted by the DLT on Feb. 27. While the organization boasts a roughly 600-employer membership, RINLA chose 20 companies to take part in the apprenticeship and split them into two groups based on size and in-house resources. The first comprises 18 smaller companies that might not have highly evolved training programs or human resources departments. Of that group, a dozen companies have signed up mostly single representatives for an initial round of formal training. Forming the second group are SeaScape Lawncare Inc. based in Coventry, a lawn care and landscaping firm that employs 56, and Bartlett Tree Experts, headquartered in Stamford, Conn., with offices in East Providence and Seekonk, which employs roughly 1,800 individuals in nearly 30 U.S. states, England, Ireland and Canada. These firms have in-house training programs but are looking for formal human resources services. Nine SeaScape employees and five from Bartlett’s Seekonk branch signed up. In total, 32 apprentices have signed on to the program – nine women and 23 men – ranging in age from 18-40, with varied industry experience. Thirty of the 32 took part in the preliminary February training, which focused on reviews of horticulture, landscape, hardscapes, basic plant physiology, plant health care basics, nutrients and fertilizers, soils/compost/mulch, pest management, and foods, crops, farming and urban agriculture. The spring curriculum will include masonry/permeable paving implementation, green infrastructure and rain garden maintenance, residential property water management, machinery engine care and computer training – much of which was also covered in the winter session. RINLA will initially operate a one-year apprenticeship program with the hopes of expanding it to a five-year course including “leadership and supervisory training,” said Brawley. 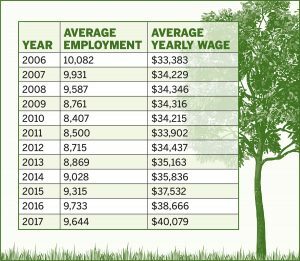 According to the DLT, the state’s green-collar industry has some catching up to do in job recovery after the Great Recession. 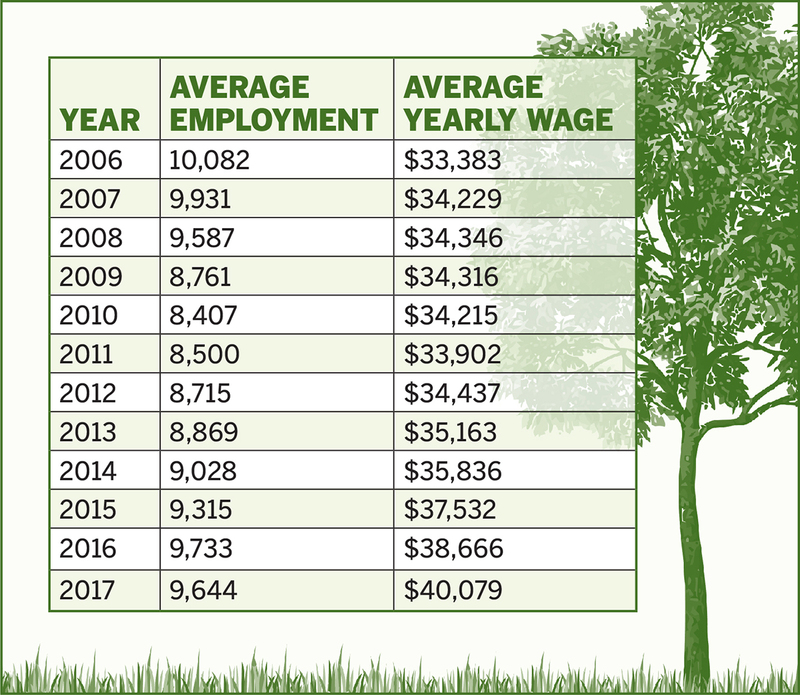 Average employment in the green-collar sector in 2006 was 10,082, per DLT data. It fell in the following years to 8,407 in 2010 (its lowest point), marking the loss of 1,675 jobs from 2006. From there it started an upward climb, with 2016 average employment at 9,733. With a gain of 1,326 jobs since 2010, the recovery accounts for nearly 80 percent of the total jobs lost between 2006 and 2010. As useful as those figures are in showing the need for more green-collar industry workers, they do not give a full picture of the industry’s impact on the state’s economy. For example, the 2015 URI-RINLA report, which cites Rhode Island Directory of Registered Nurseries and Licensed Nursery Stock Dealers data, as well as R.I. Department of State databases, describes a much larger sector than the DLT employment numbers. Per the findings, as the ninth-largest sector in the Rhode Island economy, the green-collar industry accounts for $2.5 billion in annual sales and 15,826 jobs. By comparison, DLT put industry employment at 9,315 in 2015. Thomas Sproul, URI associate professor of environmental and natural resource economics and author of the URI-RINLA report, said his data was solely sourced from a combination of RINLA surveys and purchased market-research figures outlining Rhode Island green-collar sector employment. “The numbers may be higher [due to the report’s] inclusion of sole proprietorships,” which may not be registered with the R.I. secretary of state’s database, he said, and account for as much as “60 percent” of sector employment. Donna A. Murray, DLT assistant director of labor market information, explained her data counts the number of employees “covered for unemployment insurance” as sourced from mandatory reporting of company payrolls. She agreed “agricultural employment … all of which might not be covered for unemployment insurance” could account for some of the difference in the job totals. The URI-RINLA report also said spillover impact from green-collar services was responsible for another 7,736 jobs and $1.89 billion in spending. Even if you accept the industry’s own study on employment as the most accurate, it doesn’t lessen the need for more skilled workers, say local employers. Shirley Beuth knows the impact a lack of qualified workers has had on the green-collar industry all too well. 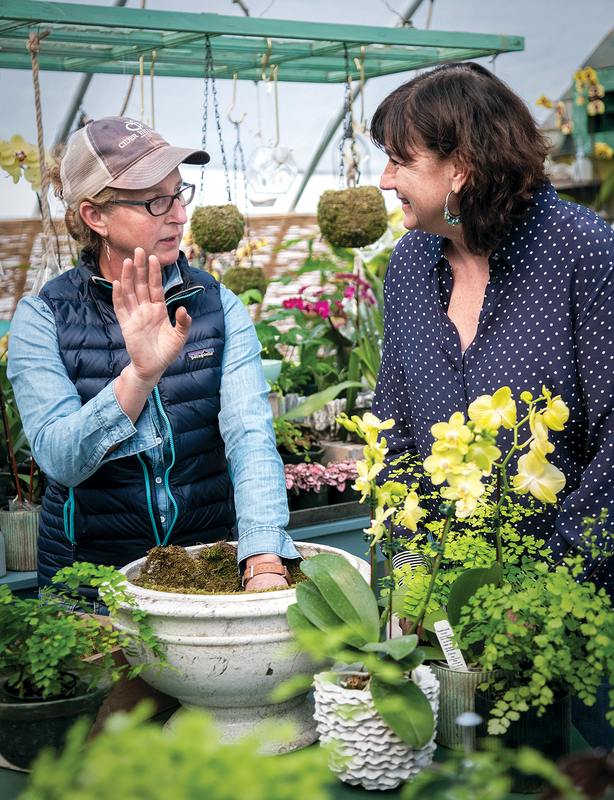 The early history of her Wyoming-based landscape gardening and horticulturalist firm Fleurs Inc. in Richmond is dotted with “fits and starts,” said the president and co-owner. Launched in 1983 and incorporated in 1989, it took her a few seasons to even bring her husband onto the payroll because of the company’s limited resources. Today, Beuth has 15 full-time employees and one part-time bookkeeper but says a lack of skilled workers has “very much” been a frustration over the years. 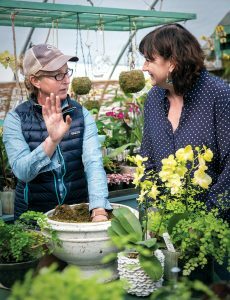 “Traditionally, landscaping is not one of the more high-paying industries when you consider computer science or any kind of corporate or engineering work” and therefore has not been as attractive to younger generations, she said. RINLA’s apprenticeship program attempts to bridge the money gap with an “earn while you learn” model that provides for on-the-job training of new hires and could lead to higher-paying positions. That, said Beuth, “perked up a lot [of ears]” and, as a result, she took on five new employees this season. One company that does is Wild & Scenic. Being asked to represent the company in the apprenticeship program, MacDonald said the nomination made her feel valued – for what she thinks might be the first time in her professional career – and that’s spread into other parts of her life. “If I weren’t in this program, I don’t think I would be as eager to plan [large financial purchases] two to five years” out, she said. In fact, thanks to her financially stable employment, MacDonald and her husband wed last year, purchased a home and she now has time to devote to personal artistic goals. Most employers said they enrolled workers in the apprenticeship program whom they felt held management potential, had an open mind and were dedicated. Those same employers are now reporting increased interest from the remainder of their workforce who are intrigued by what their colleagues learned from the winter intensive-training program. “As an employer, I’m excited to hear that because it means they will stick with me,” Beuth said. “We put a lot of effort into training people and we want to have a continuity of employment,” she said. Beuth and other green-collar business owners would welcome a reinvigorated workforce. What they’d like to see next is the promotion of the sector at Rhode Island high schools. Rick Miranda, president and owner of Aquidneck Landworks in Middletown, employs five or six full-time workers year-round and ramps up to 25 in the high season. He believes RINLA should extend opportunities to high schoolers who “already know they aren’t going to college” before they discover the automotive-repair, electrical or general-trades sectors. This work, said Miranda, has much more to offer them, but the younger generations haven’t caught on because awareness of the sector’s opportunities is low. “They hear landscaping and they think cutting grass,” said Miranda. Brawley knows increased recruitment is fundamental to the sector’s health, given a predicted increase in demand for green-sector services due to “coastal concerns.” Arborists, climate change adaptation and green infrastructure, water management and flooding, food production and food-distribution infrastructure will be the sectors to see the most growth, by her account. Beuth says homeowners are increasingly wanting to protect the “thousands, if not hundreds of thousands, of dollars” they invested in their landscapes. “The thrust of our business is maintenance,” she explained. Brawley says the increase in major climate and storm events could also increase demand for green-collar services. “I don’t envision [the green-collar sector] ever not being busy,” she said. Brawley is thankful for the initial Real Jobs RI money but is focused on the sustainability of the program and ending its reliance on grant funding. Her goal is to create a multiyear program with specialties targeting different points in a green-collar worker’s career. But that will take time and money, she says. For now, cold weather remains the seasonal gut punch to the local industry. As the ground hardens and snow begins to fly, demand for outdoor projects falls, leading to widespread layoffs. Operations halted for Fleurs on Dec. 19 last year and picked up again on March 9, “but we’ve had four false starts this year,” said Beuth, because of the unpredictability of the New England climate. While she does lay off workers in the winter, Beuth uses that period to “recharge batteries” and focus on “further education and training” for workers. While “we’re at the mercy of Mother Nature,” said Matthews, he says the solution to the perennial issue of layoffs lies in the apprenticeship program. By last Christmas, he said, “we ran out of work … my hands [were] tied” and he had to lay off his only full-time worker. The training provided by RINLA will hopefully “broaden [the workers’] skills” enough, said Matthews, to increase their ability to take on enough work to sustain employment of more full-time workers year-round. In contrast, James Wilkinson, owner and president of SeaScape, created a fourth plinth on which to support his business and stretch the high season – holiday-decoration installation and removal. While this strategy lasts into early January, for Wilkinson, the first month of the calendar year still flummoxes his productivity. Calling January “one of the real challenges” to the industry, Wilkinson said SeaScape tried plowing but “didn’t recoup” the investment. Even with last winter’s unusual challenges, Fleurs’ Beuth found ways to work around them. Opening on March 9 – “one of the earliest start dates for us,” she said – the company prioritized staff training and worked in the greenhouses when they couldn’t get to the fields. “As much as it’s been a difficult beginning of the season, we’re doing OK and there’s ample work,” she added.